Are you on the hunt for professional cleaners in West London? If you happen to live or have a commercial property located in West London and you need an experienced cleaning company to help you clean and tidy up, then you have come to the right people. We cover all London areas and surrounded cities. It is indeed a welcome invitation to all sorts of risks and potential damages when you let strangers enter your homes or premises. You can avoid these incidents if you hire our professional cleaners in West London. You can be confident that you have hired a reputable company to help you clean your home or office. It is more satisfying when you see the end results and you will not be disappointed and may well go on to use our other professional cleaning services as well. 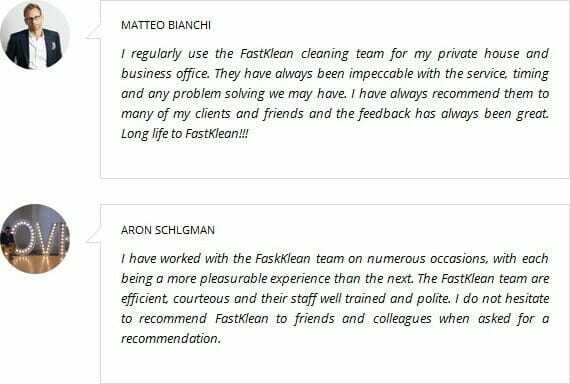 You are even more confident when you realise that your property is really in good hands when you know that FastKlean has been in the cleaning industry for more than a decade and is recognised as one of the leading cleaning companies in London. Furthermore, you can feel safe and secure when we inform you that we only use quality and industry-standard equipment and only eco-friendly solutions, and our professional cleaners are thoroughly checked and undergo expert training. In addition, you can access (by request) their references and background check information for your peace of mind. Give us a call now on 020 8884 9149 for a free quote and more information about our professional cleaners in West London.